I am really particular about my bananas. I love snacking on ones that are just on the verge of ripeness, but once they hit that ripe to slightly overripe phase? Blech: they kind of gross me out. So most of the bananas I buy end up being frozen to put into smoothies, or I let them blacken. Then I make banana bread or muffins. I have been eyeing a recipe for Coconut Cocoa Banana Muffins over on the lovely blog Food Loves Writing for a while now. Yesterday I was going to make those muffins but then I realized I was out of eggs (yes, even those of us with chickens find ourselves without eggs sometimes!). So I decided to change up the muffins a bit and make them vegan, and to leave out the cocoa and coconut since my family really prefers simple to embellished when it comes to baked goods. 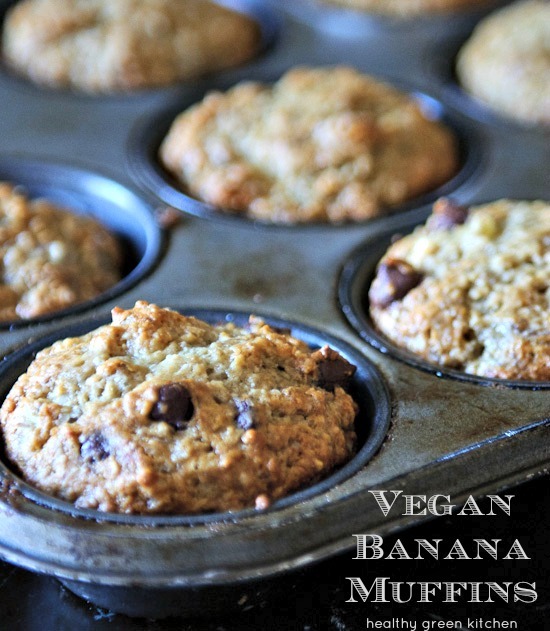 These vegan banana muffins really are exceedingly simple to make, and they are delicious! They have wonderful banana flavor and a dense texture I really like. I used Florida Crystals Demerara Cane Sugar to sweeten them, but you can use any type of granulated sugar, including organic cane sugar or coconut sugar, in yours. I tossed bittersweet, fair-trade chocolate chips into 1/3 of the batter, but accept my apologies for not measuring exactly how much I used (I am a terrible food blogger sometimes!) If you prefer to make these with an egg and butter, they won’t be vegan (but they will be yummy). We’ve been enjoying them with a smear of organic peanut butter on top. Be sure to check out all of Shanna’s recipes. I frequently drool over her food and her writing! Speaking of her writing, she wrote one of the most beautiful ebooks I have read: it’s called Written Together: A Story of Beginnings, in the Kitchen and Beyond . I read it a few months ago and absolutely loved it…you will love it, too! 2. In a medium bowl, whisk together flour, baking powder, baking soda, and salt; set aside. 3. In a large bowl, combine bananas, sugar, flax and water mixture, and melted coconut oil. 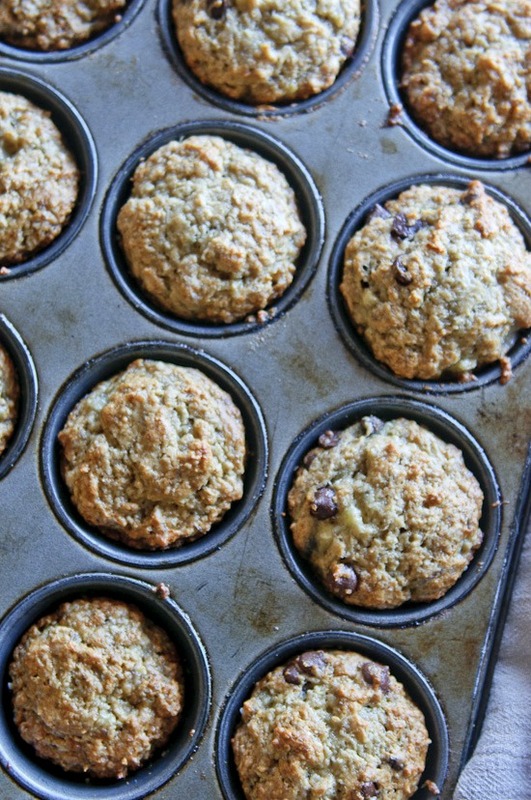 Rub a standard muffin tin with melted coconut oil (or use paper liners). Fold the flour mixture into the banana mixture, and mix until smooth. Fold in chocolate chips, if using. 4. Bake in preheated oven for 20 to 25 minutes, or until a toothpick inserted in the center comes out clean. Allow to cool slightly before removing from the pan. Adapted from Food Loves Writing. These look and sound fantastic! 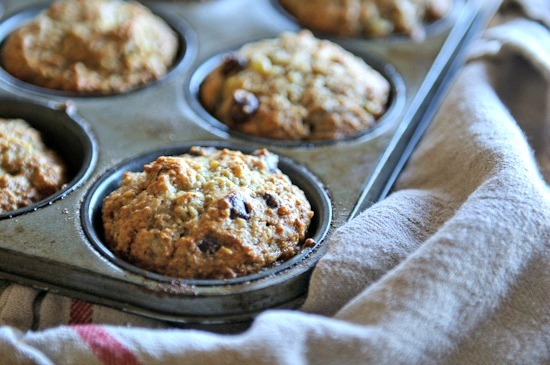 Nothing beats a banana muffin, and I almost always have ripe bananas on hand to make them! Must try this recipe next time. These sound so perfect and simple. I need to stock up on some bananas!! Your muffins look scrumptious, a perfect breakfast! I have three bananas on the counter that are past their prime and I’m trying to decide whether to bake with them today or toss them in the freezer. Muffins might be fun! Can vouch for how scrummy yummy these muffins are! Just made them and they are delicious! OMG these are the best muffins I have ever tasted! Sooo pleased I found them! Yummy! One of the first vegan recipes I tried since I went vegan 1/1/14. Thank you!!!!!! Just made them into chocolate banana muffins by substituting 2tablespoons of flour for cocoa powder. Not bad! Just made these using Earth Balance. Other than that no other adjustments. Well no chocolate chips but I plan on getting some. Fantastic recipe! Husband toddler and I all really enjoyed. 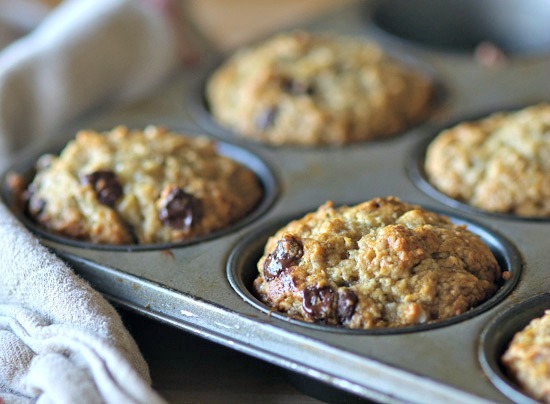 They were surprisingly light, not dense or wet like other vegan muffin recipes I’ve tried. Thank you so much for sharing! Found these needed some extra liquid, maybe where I live bananas are a bit drier. Added a good slodge of almond milk to make ingredients come together, came out perfect.